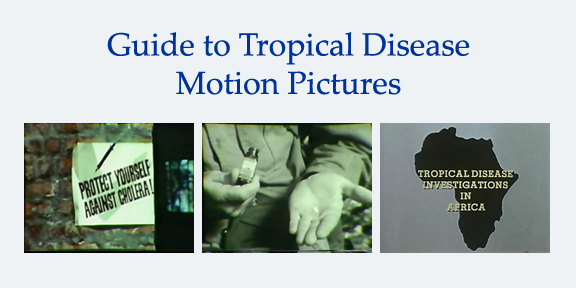 The Tropical Disease Motion Picture and Audiovisual Collection is comprised of films, videorecordings, and digital videocasts produced from the 1920s through 2009, with the majority shot prior to the 1960s. All are devoted to health concerns and include material on medicine and public health. Materials range from ideological, documentary, educational, and training films to American war propaganda. The intended audience is diverse and includes military personnel, health professionals, and the general public. The collection will be of particular interest to scholars concerned with the social, economic, and political implications of health disparities in a world where epidemics travel with great rapidity across national and regional borders. Approximately one billion people are affected by one or more tropical diseases.1 Tropical diseases are those highly infectious diseases, such as schistosomiasis and cholera, that are more prevalent in hot, humid environments where food and water sources are easily contaminated. Many of these tropical diseases can also thrive in more temperate regions under the right combination of environmental conditions. For example, yellow fever and malaria, known for their tropical origins, were a source of grave concern for American governments during the nineteenth and early twentieth centuries prior to the successes of the Sanitary Movement when water supplies, drainage, and sewage systems were radically improved. Today, most tropical diseases are found primarily in rural areas and poor urban districts of low-income countries in sub-Saharan Africa, Asia, and Latin America, where the resources and technical knowledge needed to implement effective public health measures are largely absent. The Tropical Disease Motion Picture and Audiovisual Collection at the National Library of Medicine consists of an estimated 120 titles dealing with highly infectious diseases prevalent in hot, humid, tropical environments. Some of these diseases once were widespread in temperate regions as well, but have been contained by aggressive public health measures. The guide's scope is specifically limited to tropical diseases in tropical areas of the world. It includes films, videorecordings, and digital videocasts in both the general and historical audiovisual collections at NLM. The diseases addressed are chiefly those defined as Neglected Tropical Diseases by the World Health Organization (WHO), or as Neglected Infectious Diseases by the Special Programme for Research and Training in Tropical Diseases (TDR), established in the 1970s by WHO, the United Nations Children's Fund, the United Nations Development Programme, and the World Bank. Most of the affected areas are in developing regions of Africa, Asia, Central America, and South America, and the guide is limited to those regions lying within tropical latitudes. Material of a strictly scientific, laboratory-based nature (i.e. showing the life cycle of an organism, lab procedures, or the testing of a medical intervention) unless the lab or the activity is situated in a tropical locale. Many films address more than one tropical disease, and some deal with both tropical and non-tropical disease. Foci and contexts include causes, symptoms, prevention, treatment, the role of international organizations, public health campaigns, military needs and tactics, and the like. In 1942, the Malaria Control in War Areas (MCWA) agency was established by the Public Health Service to control malaria outbreaks in army training camps located in the southern states.8 The agency's successes during World War II at home and abroad gained it a permanent place within the Public Health Service. The division was renamed the Center for Disease Control (CDC), and with the United States Army and the Rockefeller Foundation, took on public health challenges throughout the world.9 The efforts of these institutions to identify, prevent, and treat diseases endemic to the tropics is a central theme of the collection. During World War II motion pictures gained widespread use as a medium to increase public awareness of the war and related health issues. The films provide instruction on keeping soldiers healthy behind enemy lines, and protecting the health of civilians employed in war-related work. Footage shot during the war offers insights into the use of propaganda in public health education, illustrated in the film Pacific Enemy Number 2: Malaria.11 Its message is aimed at American troops fighting in Japan and emphasizes personal and environmental strategies to stave off malaria infection. The Anopheles mosquito, the vector responsible for the transmission of malaria, is profiled throughout the film as an enemy to the United States-second only to Japan. Another work from the collection deals with wartime public health issues at home. Soldier from the Tropics combines a patriotic call with an instructive message,12 promoting public health as a civic responsibility. This film about malaria takes place in a small fictional southern town. While the primary narrative is on malaria prevention and the soldier's lax attitude in protecting himself, his loved ones, and his community, a subtext is the threat a malaria epidemic could pose to the success of the war and the American way of life. The Tropical Disease Motion Picture and Audiovisual Collection is a rich source of historical documents for researchers of diverse disciplines. Historical epidemiologists, for example, will find the collection contains case studies that deal with infectious epidemics resulting from war, conflict, and poverty. Films from this collection highlight early public health surveillance and laboratory techniques, and are good source material to examine the ideological and epistemological underpinnings of past epidemiological practices. Scholars who view public health in the tropics as a global issue also will find the collection of particular interest. Thematically, the films in this collection trace an ideological shift in American politics and public health policies that spans several twentieth-century wars and conflicts that offer some insight into domestic consequences of tropical diseases. For scholars interested in the social, economic, and political implications of health disparities, the collection provides evidence of public attitudes and government concerns that may be lost in written sources. Teachers also will find the films useful in the interpretation of twentieth-century history, western colonialism, and public health and biomedical practices. An overwhelming majority of the works in the collection were produced by federal, state, and local governments, with various private organizations producing the remainder. Private and public institutions often differed in their goals for undertaking public health interventions in the tropics, while sharing a common humanitarian concern for the health of individuals, communities, or regions. Thus, the collection may be of particular interest to film historians whose research deals with the social impact of film. In addition, most of the films are in the public domain and may be freely used. As the films in this collection show, history is more than the written word. Regardless of discipline, scholars will find that the Tropical Disease Motion Picture and Audiovisual Collection provides an array of powerful visual statements about the social and clinical nature of tropical disease, and excellent source material for interpretation into the nature of poverty, propaganda, and political rhetoric during key moments in American history. Fairchild, Amy L. Science at the Borders: Immigrant Medical Inspection and the Shaping of the Modern Industrial Labor Force. Baltimore: The John Hopkins University Press, 2003. Fee, Elizabeth. "Public Health and the State: The United States." The History of Public Health and the Modern State. Ed. Dorothy Porter. Amsterdam & Atlanta, GA: Editions Rodopi B.V, 1994. 239-241. Furman, Beth. A Profile of the United States Public Health Service. Bethesda: Government Printing Office, 1973. Humphreys, Margaret. Malaria: Poverty, Race, and the Public Health in the United States. Baltimore: The Johns Hopkins University Press, 2001. ------. Yellow Fever and the South. Baltimore: The John Hopkins University Press, 1999. Jeffery, Geoffrey M. "Contributions of the U.S. Public Health Service in Tropical Medicine: Part II." Bulletin of the New York Academy of Medicine 4 (1968): 737-746. Koppes, Clayton R. and Gregory D. Black. "What to Show the World: The Office of War Information and Hollywood." The Journal of American History 64 (1977): 87-105. Kraut, Alan D. Silent Travelers: Germs, Genes and the Immigrant Menace. Baltimore: The Johns Hopkins University Press, 1995. Larson, Cedric. "The Domestic Motion Picture Work of the Office of War Information." Hollywood Quarterly 3 (1948): 434-443. Rosen, George. A History of Public Health. Baltimore: The Johns Hopkins University Press, reprint 1958. Tomes, Nancy. The Gospel of Germs : Men, Women, and the Microbe in American Life. Cambridge MA: Harvard University Press, 1998. Weinstein, Paul P. "Parasitology and the United States Public Health Service: A Relation of a Science and Government." The Journal of Parasitology (1973): 3-14. Williams, Ralph C. The United States Public Health Service, 1798-1959. Washington: Government Printing Office, 1951. Wilson, Charles Morrow. Ambassadors in White. New York: Henry Holt and Company, 1942. Yoeli, Meir. "The Evolution of Tropical Medicine: A Historical Perspective." Bulletin of the New York Academy of Medicine 4 (1975): 1231-1246. The World Health Organization (WHO) has coined the phrase Neglected Tropical Diseases (NTDs) to refer to diseases which persist primarily in the poorest regions of the world, having been eradicated or controlled in more affluent areas. WHO identified fourteen NTDs: Buruli ulcer, Chagas disease, cholera/epidemic diarrhoeal diseases, dengue/dengue haemorrhagic fever, dracunculiasis (guinea-worm), endemic treponematoses (yaws, pinta, endemic syphilis), human African trypanosomiasis (sleeping sickness), leishmaniasis, leprosy, lymphatic filariasis, onchocerciais, schistosomiasis, soil-transmitted helminthiasis, and trachoma. These diseases are given less priority than those diseases that have high mortality rates even though the symptoms caused by NTDs can be disabling and chronically painful resulting in lifelong disfiguration. Malaria, yellow fever, and tuberculosis are also included among the list of tropical diseases in this guide, but have had highly visible attempts at eradication and prevention. World Health Organization. Neglected Tropical Disease Brochure. Pg. IV., Ref:WHO/CDS/NTD/2006.2) <http://whqlibdoc.who.int/hq/2006/WHO_CDS_NTD_2006.2_eng.pdf> 08 November 2008. Meir Yoeli, "The Evolution of Tropical Medicine: A Historical Perspective," Bulletin of the New York Academy of Medicine 4 (November 1972) 124. Paul P. Weinstein, "Parasitology and the United States Public Health Service: A Relation of a Science and Government," The Journal of Parasitology 59 (February 1973)11. This burden can exist in more developed countries as well, particularly in marginalized poor communities where resources for public health interventions may be woefully inadequate. For a comprehensive narrative on the history of the Public Health Service see: Ralph C. Williams, The United States Public Health Service, 1798-1950, (Washington: Commissioned Officers Association,1951). Beth Furman, A Profile of the United States Public Health Service, 1798-1948, (Bethesda: Government Printing Office,1973). For the role of the Public Health Service in the evolution of tropical medicine as a discipline see: William B. Dewitt, "Contributions of the U.S. Public Health Service in Tropical Medicine: Part I," Bulletin of the New York Academy of Medicine 44 (June 1968)728-736. There was also a humanitarian impetus for the expansion of public health. Public health reform was, by virtue of the rapidly growing population during the nineteenth century, designed to mitigate the adverse health effects that were primarily a consequence of industrialization. As a consequence, reformers called for government intervention in areas such as child labor, housing and work conditions, as well as a wide variety of social issues related to the basic needs of the working poor. For an in depth analysis on public health reform during this period see; John Duffy, The Sanitarians: A History of American Public Health, (Urbana: University of Illinois Press, 1990). George Rosen, A History of Public Health, reprint 1958 (Baltimore: The Johns Hopkins University Press, 1993). Nancy Tomes, The Gospel of Germs: Men, Women, and the Microbe in American Life. (Cambridge: Harvard University Press, 1998). Policies to impede immigration during this period were shaped by a combination of Nativist fears regarding a swelling population, immigrant indigence, and fears of contagion. For a perspective analysis see: Amy L. Fairchild, Science at the Borders: Immigrant Medical Inspection and the shaping of the Modern Industrial Labor Force (Baltimore : John Hopkins University Press), 2003. Alan M. Kraut, Silent Travelers: Germs, Genes and the Immigrant Menace (Baltimore: John Hopkins University Press) 1995. Elizabeth Fee, "Public Health and the State: The United States", in The History of Public Health and the Modern State, Dorothy Porter ed., (Amsterdam & Atlanta, GA: Editions Rodopi B.V) 239-241. See also: Charles Morrow Wilson, Ambassadors in White (New York: Henry Holt and Company, 1942). Although this is more a biographical profile of four early pioneers (Carlos E. Finlay, Walter Reed, William C. Gorgas, William E. Deeks and Hideyo Noguchi) in the field of tropical medicine, it highlights the role played by the military, the Rockefeller Institute for Medical Research, and the United Fruit Company in tropical disease research during the first half of the twentieth century. Geoffrey M. Jeffery, "Contribution of the U.S. Public Health Service in Tropical Medicine: Part II," Bulletin of the New York Academy of Medicine 4 (June 1968) 737-746. Elizabeth Etheridge, A History of the Centers for Disease Control (Berkeley: University of California Press), 1992. 1-17. The Southern economy remained severely depressed through the 1940s when compared to the North--a lingering effect of its reliance on an agrarian slave-based economy. The social and economic development in the American south has thus been likened to that of low-income countries. For a detailed account on Southern efforts to develop its economy see: James C. Cobb. Industrialization and the Southern Economy (Lexington: University Press of Kentucky) 1992. For an account of public health and tropical disease within the context of a struggling economy see: Margaret Humphreys, Malaria: Poverty, Race and Public Health (Baltimore: John Hopkins University Press), 2001. For a perspective analysis on the Office of War Information's relationship with the movie industry during WWII see: Cedric Larson, "The Domestic Motion Picture Work of the Office of War Information," Hollywood Quarterly, 3(Summer, 1948), 434-443. Clayton R. Koppes and Gregory D. Black, "What to Show the World: The Office of War Information and Hollywood, 1942-1945." The Journal of American History, 64 (June, 1977): 87-105. These are also a part of the "Public Health Film goes to War" series of medical films produced during WWII that were compiled by M. Sappol in 1997. Depending on one's frame of reference, the Cold War began after WWII between 1945-1947, and ended with the dismantling of the Soviet empire in East Europe in 1989 or the collapse of the Soviet Union and of Communism in 1991. For example, American policies toward India were somewhat ambivalent. The United States was aligned with Pakistan and courting India ( India aligned itself with the Soviet Union) where possible due to its strategic location in the area. The on again-off again courtship was partly due to India's role in the Non-Aligned Movement (NAM), largely the brainchild of the first Indian Prime Minister Jawaharlal Nehru. The establishment of NAM in 1955 was an organized response of international states to declare neutrality in the east-west ideological conflict that shaped the Cold War. The primary objective of the movement was to band together to foster their respective economic and political independence. For a perspective on the movement's position see: Fidel Castro's speech given at the United Nations General Assembly in 1972 when he served as chairman of the Non-aligned countries. <http://lanic.utexas.edu/la/cb/cuba/castro/1979/19791012> 08 December 2008. Direct quote made by the narrator in the film.